I am not Qu. I am merely borrowing his name. My true name would drive you all mad and usher in the end of times. I’d say I’m ready to merge the experimental and main branches. Let’s hope this works! * Prevented an ArithmeticException related to leg animations from causing crashes when it happens. * Fixed a bug preventing the “Spinner” controls (up/down arrows next to number inputs) from working. * Made a number of changes to the UI to better support the new variable-sized fonts. * Variable font sizes! Should be of some assistance to people on high resolution screens. You’ll find the dropdown in the “Options” menu. * Fixed multithreading bug that could cause a random crash in long running games. * Improved alignment of some UI features. * Made Nurse Bots reset NumberOfChildrenBirthed so that artificial selection won’t stagnate when specific parents are kept alive. * Adjusted grazing to be more random and less biased towards travelling in a specific direction. * Fixed a crash when exporting an engineered genome. * Fixed a crash that happened randomly in longer running games. * Adjusted childhood to ‘pull’ a consistent amount of energy each frame, and childhood length to depend on total energy spent (rather than pulling a variable amount depending on childhood length). – This will fix the problem with food energy flickering up and down. * Increased ‘base’ stamina amount (to make adulthood easier). * Fixed an issue with empathy cost being applied to creatures outside the predators species (which stacked with the first issue to prevent hunting). * Fixed bug preventing brain report (eg. “Hunger >> Graze”) from appearing in UI. * Fixed potential crash when mating/gene splicing. * Fixed a bug causing the skybox to render at half resolution and show distant mountains on the ‘ocean’ maps, which was never intended. * Displayed balance forces in the gene editor when “Draw Bones” is selected. * Activated the nursery UI when the first creature is dropped in, to better help players understand how it’s supposed to work. Now available on the Steam experimental branch. 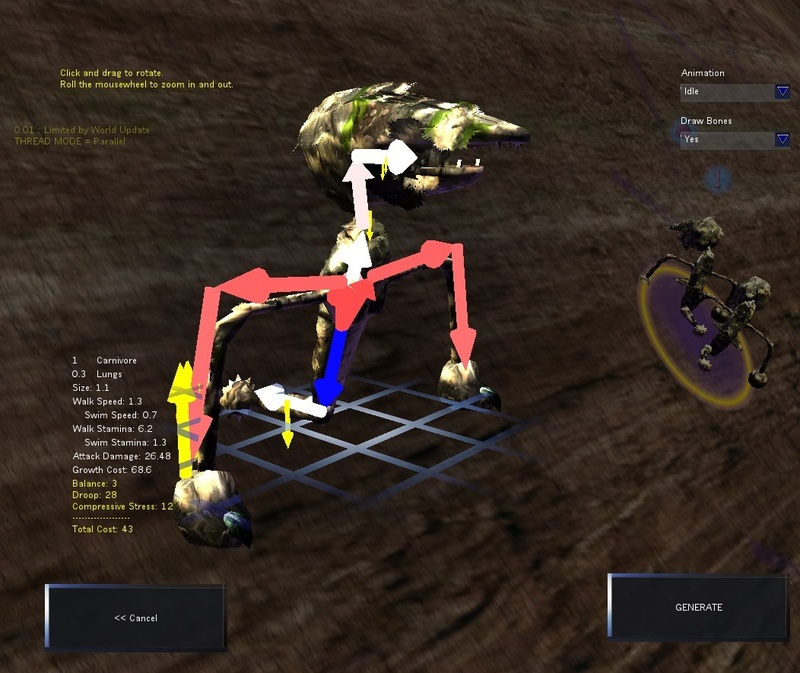 * Gene Editor now includes a “Draw Bones” option, allowing you to visualize the skeletal physics that govern creatures body plans. Early adopters rejoice! I’ve just put Species 0.12.0, the Multithreading Update, up on the Experimental Beta Branch on Steam! 0.12.0 adds multithreading to the underlying game engine, significantly increasing the performance (and Creature Count) of the game on computers with Dual-Core, Quad-Core, Octo-Core or Septendec-Core CPU’s. Please note that this is an Experimental Build. It is likely to be less stable and less performant (though still more performant than 0.11!) than the version that will be soon released to all Steam users. You can access the Beta branch by right-clicking on “Species: Artificial Life, Real Evolution”, selecting “Properties”, then opening the “Betas” branch and selecting “experimental – Unstable Experimental Builds” from the drop down. At the moment, 0.12.0 adds no features or tweaks: it’s the same game, but faster. In addition to the obvious stability work, I will be polishing it in the coming weeks to make the survival strategies and body plans more varied and interesting, as well as see if I can make carnivory more viable.